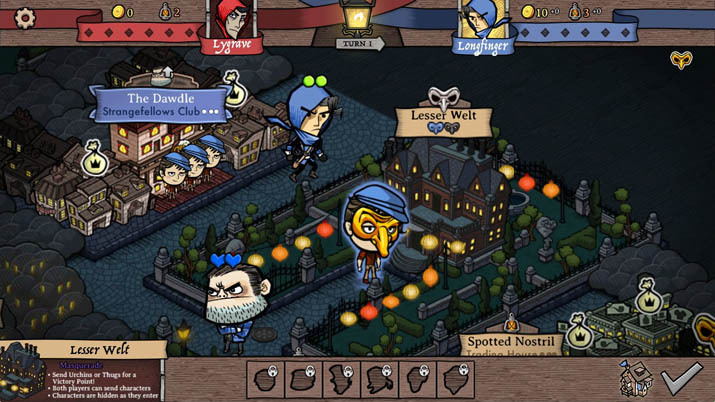 Antihero is a turn-based strategy game, set in the Victorian era, that involves burgling houses, forming gangs, and forcing street urchins to do your bidding. Or, at least it will be; I played the Early Access version, and the full version is expected to release in mid-June. A story-based campaign is supposed to accompany the release, which would definitely add depth to the experience, but one can’t evaluate hypothetical content, so this review focuses on what is actually present so far. That said, Antihero has potential, so take any criticism with a grain of salt. Antihero’s setting is full of character. You can also choose from a wide selection of master thieves to lead your guild, but as of yet this is only a cosmetic choice. We can only hope that, in the final release, the master thieves are differentiated from one another, each uniquely affecting gameplay in some way. The victory conditions provide for a wide variety of strategies. There are a few different map choices, each of which comes with its own way to get victory points. In most cases, you need five victory points to win, and these can be earned by blackmailing churches [EN: Nice. ], buying bribes, or assassinating targets. With a tech tree that focuses on three different areas, the variety of victory point-acquisition methods allows for a few different strategies to keep matches interesting. The maps add to this: For instance, if you are at the harbor, you can infiltrate cargo ships for victory points. 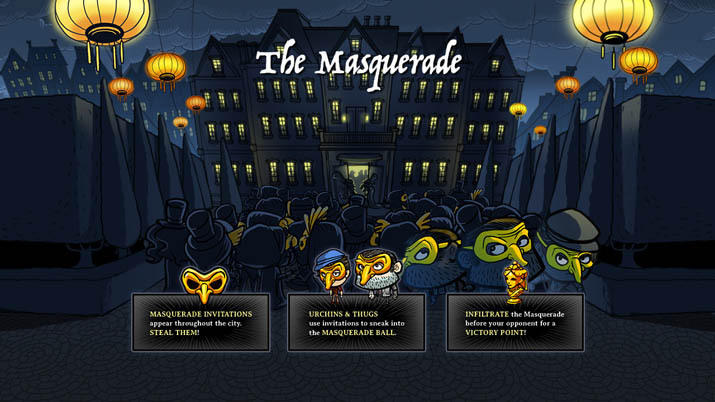 In another map, you can steal invitations to masquerade parties in order to sneak into a manor and steal valuable heirlooms. And, if you play on the palace map, you can take control of guard towers and leave the palace vulnerable to burglary – a required condition for victory. With two types of resources, one generally used for upgrades and the other used for hiring lackeys, a few options are available to grow your thieves’ guild and attain your nefarious goals. Infiltrating and upgrading buildings with urchins allows for different ways to modify your economy and abilities in a manner that satisfyingly scratches the itch for those of us that love upgrades. However, the small tech trees get a little boring after a few games. For example, thugs are not incredibly useful, yet they have three upgrades devoted to them, two of which just add another health point. The same goes with the variety of buildings. There are some interesting strategies – fully upgrading the orphanage allows your urchins to evict enemies from their buildings, which is OP in a satisfying way – but again, after a couple of playthroughs, you are left fruitlessly searching for more options in this vein. Everything, from characters, to victory points, to map variety, leaves you with the same feeling: Antihero seems anticlimactic and unfinished. Fortunately, in this case, that’s because it is. 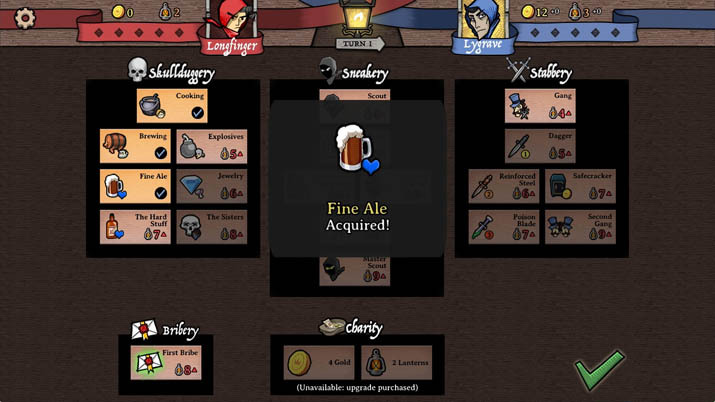 The core gameplay that has been released for Early Access is promising and relatively bug-free – I only had trouble with the map in the beginning because I reflexively wanted to push the mouse to the edge of the screen to move around but found I needed to click and drag, which was vexing when dialogue boxes kept popping up outside the visible area. Regardless of its solid design, the title as it is now leaves you wishing there were more. The developers note that the AI is currently pretty dumb and, indeed, it’s easy to trounce an AI opponent, once you get the hang of the mechanics. Left without a satisfying challenge, you must explore the experimental multiplayer options. Instant multiplayer is still in development, and you need a friend ready to play with you because there is no matchmaking yet. “Hot seat” is good if you have a friend nearby – it plays like a two person board game. There’s also a multiplayer mode where you take your turn, and then it e-mails your opponent to prompt them to take their turn. This is a very old way of doing games that, in a modern context, can seem like an awful idea at first (like playing chess through the mail), but it can actually work out pretty well. You can alt-tab and go do other things, then the program will make a sound and flash in your toolbar when your opponent has finished. Plus, it is admittedly very satisfying to finally win against an actual human opponent after a lengthy back-and-forth in this mode. Antihero is fairly well balanced and the mechanics are solid, but there just isn’t enough of it yet to make it stand out. It definitely has potential to entertain with its funny-yet-dark art and play styles, but so far it lacks any sort of story or variety. While I have high hopes for this title, we will just have to wait and see if it lives up to its potential.